It may be winter, but that doesn’t mean the wedding season is hibernating. Even though the most popular month to get married is June (accounting for 15% of all weddings), you can be surprised with a wedding invitation or save-the-date at any time of year. Unfortunately, not all guests’ budgets allow for opulence and extravagance, but with a few smart strategies, you can attend any type of wedding without breaking yours. Here’s a quick guide to help you keep your budget in mind when attending a wedding as a guest. First, many wedding guests feel the need to invest in a new outfit just for the occasion. While it’s a nice and certainly tempting thought, it isn’t always a feasible idea for all budgets. Instead, consider borrowing pieces of your ensemble from a similarly-sized friend, or opt for a clothing rental service like Rent the Runway or The Frock Shop, where you can rent anything from apparel to accessories. Of course, you also shouldn’t feel obligated to seek out new apparel or accessories if you already have a decent collection yourself. Plus, you can always invest in affordable alternatives to high-end clothing and accessories that provide the same luxurious look. For example, instead of a gold watch, consider a “gold-plated” watch, which has a coating of a gold alloy over a base metal by either electro-depositing and/or a chemical process. Recommended minimum thickness should be 10 microns thick. While the end result isn’t as valuable as a designer watch, no one will notice the difference, we promise. 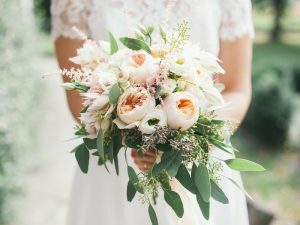 From Rent the Runway to costume jewelry, there are plenty of ways to be creative and frugal when finding a wedding outfit that reflects your personality and uniqueness. Just because it’s not ‘prime’ wedding season doesn’t mean you can’t pamper yourself a little bit beforehand. In you’re interested in getting a new look prior to your friend or relative’s big day, there are plenty of ways to get great deals. Groupon is just one website designated to providing its users with discounts for local services, which means that with some research, you’re sure to find a deal for that tanning salon you’ve been wanting to visit or the new teeth whitening method you’re just dying to try. According to an AACD survey, virtually all adults (99.7%) surveyed believe a healthy smile is socially important, so don’t feel as if you have to sacrifice your self-confidence just to save a few dollars. Finally, if you’ve been invited to multiple weddings and are worried about having the budget for each of them, consider starting a savings account designated to wedding funds. If you put away even $25 a week, you’ll have almost $1,000 by next year. Starting a designated savings account is a tried-and-true method for accumulating money for almost any purpose, but starting a savings account solely dedicated to wedding festivities can help you feel like you’re on a bit of a vacation when it comes time to cash out. With this method, you’ll feel much more comfortable budgeting because the money is already there for a designated purpose. Ultimately, these tips can help you budget your funds and ensure that you’re never caught off guard when it comes to tying the knot. Don’t be afraid to get creative and resourceful when it comes to arriving at any wedding in style and in budget!